Freddie Green is quite probably the most famous rhythm guitarist in the history of jazz. His playing is celebrated for its swing, its musicality, and its economy. Playing in the rhythm section of the Count Basie Orchestra, Green used small, often 'incomplete' chord voicings that gave him great melodic freedom. Using these voicings he could create a swinging harmony line to the traditional four-to-the-bar walking bass lines in swing era jazz. This gave the rhythm section in which he played a full, lush sound, while still leaving quite a bit of space for Count Basie's piano. These chord voicings have become the gold standard for beginning jazz comping. Over the next few posts I will lay out some of the basics of playing in this style. From there, perhaps we can explore other places where knowledge of this style might take us. 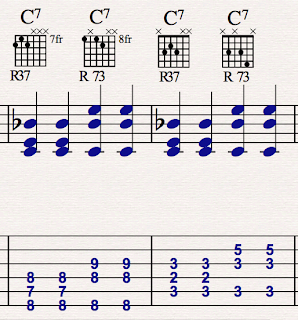 To begin, here are some chord voicings similar to those that Freddie would have used. All of these voicings are three note voicings in root position. They contain the root, third and seventh of each chord, and omit the fifth. Three of the most common chord types are represented in this lesson: Major Seventh, Dominant Seventh, and Minor Seventh. Four different voicings are given for each chord type. I've labeled the chord diagrams so you can see which parts of the chord are on which string. For now, the root is always on the 5th or 6th string. And the 3rds and 7ths of each chord are on the D and G strings, or the G and B strings. Take some time to get familiar with these chord shapes and find fingerings that are comfortable for you. There's no right way to finger these chords. It is an option to use your thumb to fret notes on the sixth string. Have fun, and I'll be back with some suggestions for using these chords and more over some common jazz chord progressions. The physical aspect of playing guitar involves a great deal of muscle memory. Learning the instrument depends a great deal on isolating different physical patterns and ingraining them until you can repeat them automatically. Here is a good basic article that talks about some different ways you can work on muscle memory in your practice. 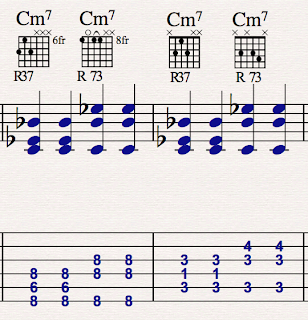 One of the most basic muscle memory issues for beginning guitarists is the consistent formation of chords. This usually becomes obvious when a new student tries to learn how to change chords. In the article in that link, I talk about devices about changing chords. But how can you change chords if you can't simply form one chord? Often times it is the inability to form individual chords automatically that makes it difficult to move from one to the next. What do you do when your muscles haven't developed the proper memory to form individual chords automatically? How do you work on that aspect of muscle memory? There are lots of ways to do this. One way I encourage my students to try to do this is BLIND. That is, to have them learn to form chords while not looking at the fretboard. Because your visual sense has the capacity to dominate your other senses, the tactile act of touching the strings and fretboard may not get all of the attention it deserves. Your eyes distract you from the work of your fingertips. As you get better at doing this, you can even do some of this practice while multitasking: looking out the window, or even (gasp!) watching TV. It's VERY SLOW in the beginning. Which is good. The most common mistake made in trying to learn the guitar is going too fast. Tune your guitar, by ear, or with your guitar tuner so that you will be able to tell by listening whether or not you have fretted the guitar correctly. 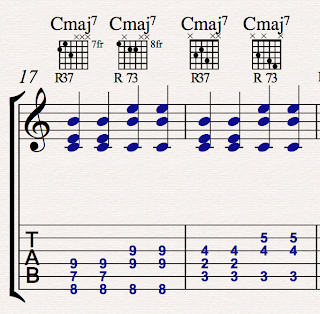 Let's try forming one of the chords in this diagram without looking at the fretboard. Let's start with the Am, or A minor chord. Look at the diagram for a minute or so so you have a visual in your mind of where your fingers will need to go. First, just get your bearings on the instrument with out looking. Take your hand, without looking, and place it on the neck of the guitar. Slide your hand all the way out to the headstock of your guitar. Take your first finger and put it on the strings and feel them one at the time with the tip of your finger. Feel their relative thinness and thickness. The thinnest strings will be closest to the floor. Thickest will be closest to the ceiling. Follow the strings to where they pass over the nut of the guitar. Now take your tip of your index finger and place it on the thinnest string, the one that is closest to the floor. Without looking, feel your way up the fretboard to the next string. Drag the tip of your finger across so you feel the wood in between. How slowly can you do it? Hmmm? What if it's an exploration, not a race? When you are on the second string, slide your fingertip back towards the headstock to feel the nut, just to know where the string ends. Gently slide your finger forward, feeling both the string and the wood, until you can feel the first fret underneath your first finger. Now that finger is approximately where it needs to be. Adjust the fingertip can fret the note properly. Perhaps if you've been working on this chord, the other fingertips can automatically find their place by referring to the location of this finger. If not, take your third finger and place it on the second string directly in front of your first finger. Feel the second string and the wood beneath it. Drag it up one string to the third string. Now it's on the third string, just in front of your first finger. Slide it up, gently feeling for that second fret. When you are there, reposition the finger to best fret the note. Check your position by sound. NO PEEKING. Now I think you've got the idea. Use this same method to help your pesky middle finger find it's appropriate place on the third string. Try this method with any chord you are having trouble with. It will slow you down and get you focused on how the guitar feels, and not just how it looks.